When a parent is thinking of providing online safety to their children, bullying comes readily to mind. Bullying is a major behavioral problem most parents want to curb as soon as it occurs, but it can sometimes be difficult to identify. Social media based cyber bullying is easier for parents to keep tabs on than physical bullying, but can still take hours of social media monitoring to catch. The MamaBear app gives parents an alternative to hours of digging through social media. It allows parents to monitor a child’s social media language or bullying behaviors in real time. Children can be tempted to get profane online when sitting behind a computer or phone. Casual profanity, even with friends and peers in social media, can be an indicator that a child is starting to engage in bullying. MamaBear updates parents when the child uses words the parent enters as restricted on both Facebook and Instagram. This allows parents a real-time, real world answer to a child’s social media hijinks. The MamaBear child monitoring app offers parental updates for specific words. Parents can assemble a list of unacceptable profane or hate language and MamaBear will offer alerts each time those words are used. Regular name calling and casual bullying of friends and peers are surefire signs a child is probably taking bullying behavior too far in other instances. This type of behavior can start, and spiral out of control, on social media. Social media removes tone, body language and other physical communication indicators that can turn what may be meant as a joke, light-hearted or funny to one person to being received as intolerant and insensitive by another. Social media can provide a nearly anonymous facade that a child can use to say all manner of unfortunate things to others online. Monitoring a child for insulting or derogatory terms and expressions is not the only way to improve online safety for children. The MamaBear child monitoring app gives parents an efficient and simple way to monitor these behaviors on social media with a relevant scenario to start an appropriate conversation about respect and unintentional bullying with their child. It’s a tool to help stop the behavior early. It can also be a tool for awareness if your child is a victim of bullying. Having the proper knowledge can help spark a conversation about how to work as a team to put an end to it. MamaBear can also issue alerts for both single words and terms like “I’m sorry” and “leave me alone” so that parents can get alerts when a child is being bullied. And don’t forget the whole other language of acronyms being used. Children left unattended online risk both being bullied and becoming bullies themselves. It is important to talk to your children about their personal digital footprint they are creating now and the lingering effects of their social media actions when it comes time to be accepted in a college or even when getting a job. They are creating a reputation and persona for themselves that can be permanently recorded. 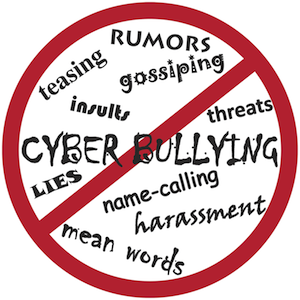 Social safety for children is important for parents and bullying behaviors run rampant online. MamaBear gives parents a way to monitor a child’s social media account without personally observing it for hours every day. Parents can spend far less time worrying about Facebook and Instagram. For a parenting resource about bullying – see Carrie Goldman’s site and book, Bullied. If your child is a victim of cyber bullying, there are many great online resources where you can reach out for help. Previous PostPrevious Dealing With Drop-Off Anxiety? There’s an app for that. Next PostNext Restricted “Friends” via Social Media Tracking?